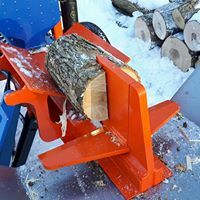 At Eastonmade we offer multiple wedges and attachments that make getting your firewood perfect easy. We can custom make just about anything to suit your needs and are willing to try just about anything. Check out some of our different attachments and see what will fit your needs!!! This wedge is available for all models. It works especially well if you have extremely tight grained or over sized wood. It stands 18" tall and makes busting extremely large tuff pieces easy. The 4 way wedge comes standard on the 5-11 and 9-16 models and is optional on the 12-22 and 22-28 models. This wedge will lay completely flat and double as a single wedge. 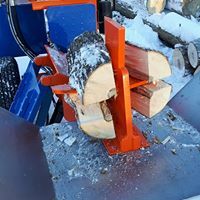 It works great in any wood and is best suited for boiler wood or when the appearance of the split wood is critical as it is much easier to control the size and shape of the wood. The 6 way wedge is available for the 5-11 through 38-40 splitters. It comes standard on the 12-22 and 22-28. I works great when speed is the name of the game in smaller rounds. The 8 way wedge performs really well in small and large diameter blocks when smaller product is required. Only available on the 22-28. Want to split that block in once pass? Than this is the one for you! Currently only available for the 22-28. Do you like the idea of those box wedge machines but hate how you are married to one style of splitter? This is the answer!!! Our box wedge is the only one on the market that offers hydraulic height adjustment. It interchanges with ANY of our other wedges. And it doesn't bind like the traditional box wedges you see. Watch the wood fall out of this thing. Who wouldn't want this instead? 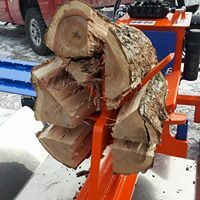 It's easy to swap one wedge for another on an Eastonmade wood splitter. It literally takes a couple of seconds. This is why Eastonmade is the most versatile machine on the market!!! Go from a 6 way wedge to a single blade and then to a 4 way. 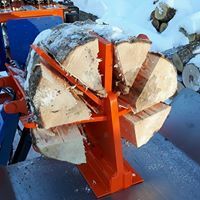 This helps make your wood perfect and your life easy!!! It's like only multiple wood splitters in one.